Update 1 (4/16/19 @ 10:30 AM IST): Samsung has revealed the Samsung Galaxy A70 will be launched in India next week while the Galaxy A80 will arrive in May. Samsung has revitalized its Galaxy A series for the generation that prefers to stay live all the time. After recently announcing its plans to merge the Galaxy J series with the Galaxy A lineup, Samsung has announced a new smartphone which sits at the top of this revamped lineup. 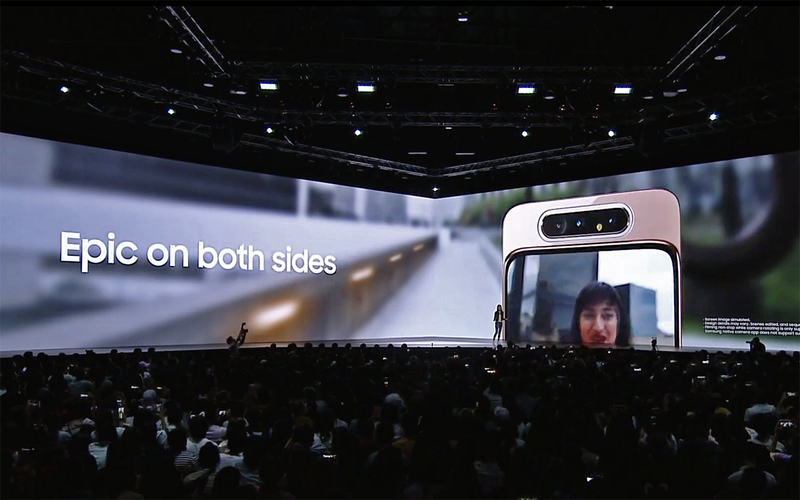 The Galaxy A80 uses a new notchless Infinity Display, which omits any cutouts for the selfie cameras and provides for an uninterrupted view. While we have been hearing about the notchless display for some time, Samsung’s intended mechanism for the selfie camera had remained a mystery until today’s event. The Galaxy A80 uses a rotating camera setup, powered by a motorized mechanism which allows you to take selfies with the rear camera. 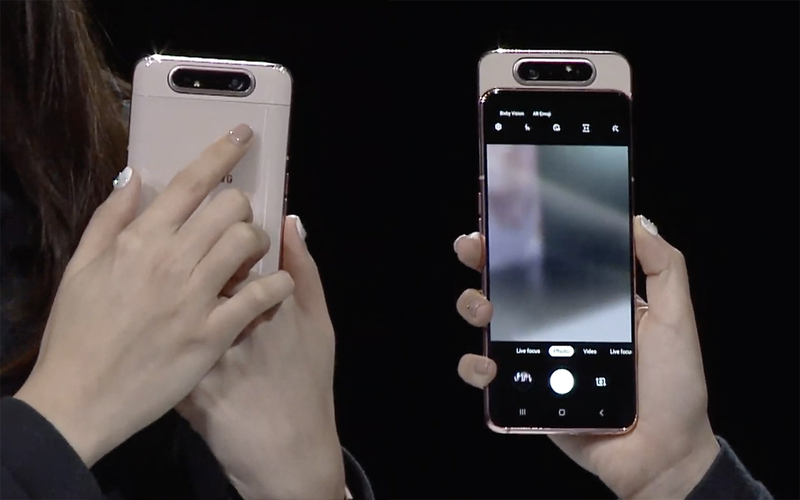 The camera reminds us of 2014’s Oppo N3 with a rotating camera, even though the swivel is much faster and smoother with the new Galaxy A80. This rotating camera setup allows Samsung to free up space, otherwise populated by the selfie camera. At the same time, it also facilitates for selfies on par with the pictures clicked with typical rear cameras. The Galaxy A80 features triple camera 48MP primary lens, an 8MP ultra-wide sensor for a wider view than what the human eye can see, and a 3D depth sensor for accurate bokeh effect as well as AR-based measurement applications. Coming back to full view Infinity Super AMOLED display, it measures 6.7 inches and supports a resolution of Full HD+. Besides lifting the overall glamour quotient of the smartphone, the display also sports an on-screen fingerprint scanner. Additionally, the upper half of the display also works as an earpiece so you can take calls without being conscious of where to place the year. The Galaxy A80 packs in a 3700mAh battery, backed by an “intelligent” algorithm that identifies your usage patterns to reduce any wastage of power and offer the most engaging performance. This, says Samsung, ensures that the battery lasts for a day long of usage. But if you still manage to run out of juice, you can replenish the battery using the 25W fast charger. Reportedly, the Galaxy A80 is the first smartphone to use the new Qualcomm Snapdragon 730G platform which is paired with 8GB of RAM. The Samsung Galaxy A80 will be available starting May 29 but Samsung has yet to reveal more information on the pricing and where will you be able to buy it. Besides announcing its latest rotating camera sensation – the Galaxy A80, Samsung also revisited the other Galaxy A series devices which it has either soft-launched or revealed only in specific markets in the past. From strictly budget-oriented Galaxy A10, to the youth-centric Galaxy A20, to the practical bundle Galaxy A30, to the performance-oriented entertainment devices like Galaxy A50, and the Galaxy A70, Samsung briefly iterated upon the qualities of each smartphone in the new and overhauled Galaxy A series. Samsung India’s marketing head, Ranjivjit Singh, has confirmed to IANS (via Gadgets360) that the Samsung Galaxy A80 and the Galaxy A70 will be launched in India in the coming weeks. Besides confirming the launch in India, the executive has also hinted at the potential pricing. While the Galaxy A70 will be priced between ₹25,000-₹30,000, the Galaxy A80 will target the premium segment with a price between ₹45,000 and ₹50,000.